Want to stop traffic with your resume next time you apply for a delivery driver job? To accomplish this, you’ll need a stand-out resume. After listing all of your relevant delivery experience, be sure to use the highlights sections to showcase the skills that make you the right person for the job, such as stellar time management skills, a familiarity with the delivery area, attention to detail, and a courteous and polite demeanor. 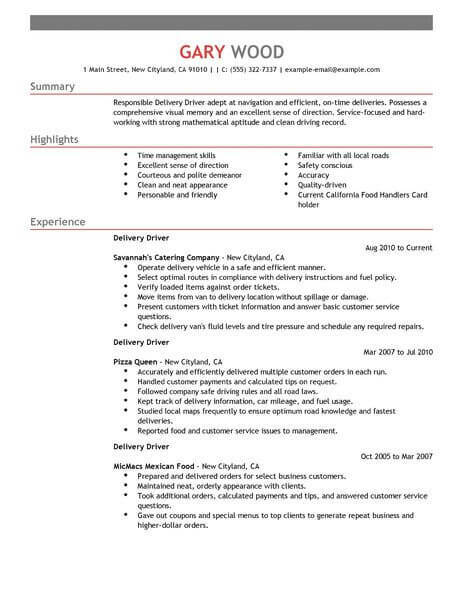 Take a look at our delivery driver resume example for more ideas on how to get on the road to a new job. 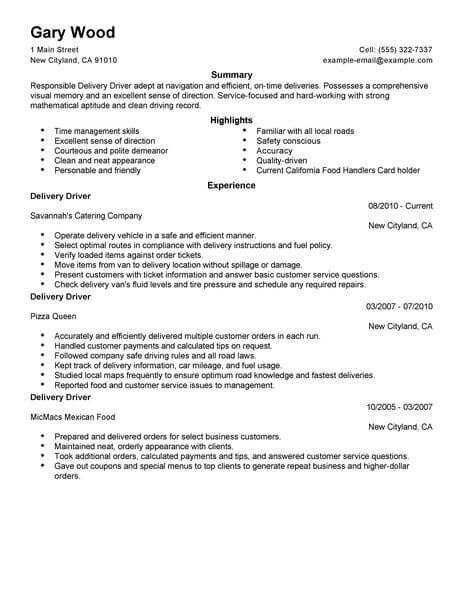 If you’re interested in being a delivery driver for a restaurant either as a full-time job or to make some extra cash, you’ll need a resume. If you don’t have one (or need to improve yours) we can help. 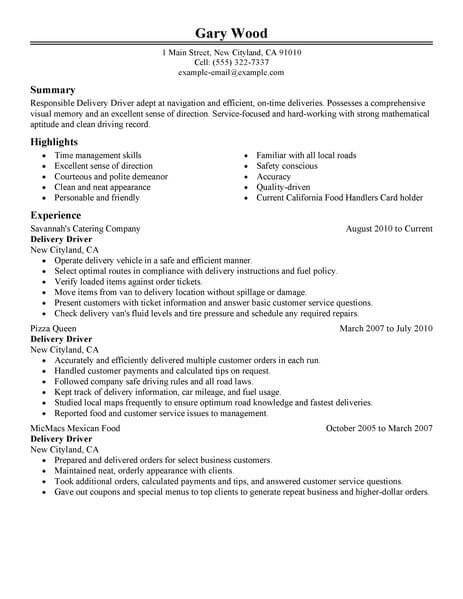 The delivery driver resume examples are easy to use. Just click on any of the examples and customize them to reflect your background and experience. Get started now with these resume examples and get the job sooner! The best way to find jobs as a delivery driver is to take the same actions you would anywhere else. These tips will help facilitate any job search. 1. Think ahead. Have a plan of action for how you will present yourself to employers before you even begin applying for positions. Research what the hiring practices are, what typical qualifications include, and ways you can leverage your experiences. 2. Know your options. In the event that there are no opportunities to pursue the work you are most interested in, you should know exactly what kind of work will still be relevant and beneficial to you. You should have more related experience when you do find your dream job. 3. Always be relentless. Your search will likely be long and difficult. Follow every lead thoroughly and only move on when you are given a definitive answer. Be sure to follow every interview and application up with a phone call. 4. Use online resources. There are plenty of tools online that will help you be more appealing to employers. There are databases of jobs, resume templates, assessments, and more. 5. Stay optimistic. Lastly, do not lose your good attitude. Searching for a job is always less stressful when you are positive, but it will also give a good impression to employers. When looking for jobs as a delivery driver, your resume will likely be the most important part of your search. 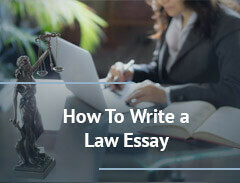 How you write it will depend on what type of job you are applying for, but these are some tips that will always apply. 1. Know what format is expected of you. Because there are so many people searching for jobs, your resume needs to be practically perfect to stand out. 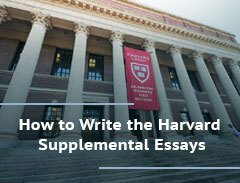 Research how to format a resume so you can get it right. 2. Be active. At first, it seems like your resume should list your previous job descriptions and responsibilities, but it is more effective to detail your accomplishments and what actions you took while working. 3. Be unique. While deciding what content to include, always think, What unique benefits will I bring to the table? How will hiring you be better for employers than hiring someone else? 4. Always take the time to analyze your resume after you finish writing. Look for large blocks of text that may be intimidating, empty or wasted space that can be made more efficient, and, of course, any typographical errors. 5. Know how long your resume should be. It is usually best to keep it on a single page, but those with extensive work histories can use a second page if they cannot adequately cover their information with one page.